If you've been around my blog for a while, you know that I am always immersed in a losing battle with the Virginia stinkbug population, which is multiplying by hoards every 30 seconds or so. Unfortunately, they don't have natural predators here, and they have an armour that protects them. So they are very difficult to kill. I've designed those homemade traps to catch them, but it can't put a dent in our problem. And every three months, I pay exorbitant prices so that Terminex can come out and tell me that there isn't much they can do about them, as we duck from little flying stinkbugs buzzing around overhead. Last week the Terminex man showed up by surprise, a new fellow who had just relocated from Seattle. Perhaps because he was new, and hadn't entered the usual resignation in the face of stinkbug infestation that is so common, he was much more enthusiastic than anyone I'd seen so far. I told him that the brunt of our issue is in the master bathroom. He went upstairs and was up there for a rather long time - so long I started to wonder what exactly he was doing. Finally, he came back down energized and excited. "I've found where the stinkbugs are hiding!" he exclaimed. "Oh really?" I say, wary, wondering how dirty this mystery area could be, and hoping I didn't leave any underwear lying on the floor. This guy actually opened the doors under our tub and got in there to spray. That's dedication folks! He finished his duties with the usual spray around windows and doors (we don't do any granules because of our chickens) and was on his way. Stinkbugs in the death throes, by the dozens. On every surface. Crawling out of crevices, in the tub, in the shower, all over the floor, climbing the walls. My first impulse was to go load the boys in the car and drive north to a climate that is too cold for stinkbugs. But then common sense prevailed and I got out the vacuum. How many stinkbugs have you flicked today, reader? Fun times, Lisa! Love your photo -- did you take that? Wow! I did read in my Countryside magazine this month about using sulpher powder to kill stinkbugs -- perhaps there's something more on the interwebs about it. Might be cheaper than the terminex man. I think stink bugs are time travelers from a future in which they have taken over the world. They send back colonies to wipe us all out....So far none at my place and only a few at Joy's. Those things are horrible. I very seldom see them here, sometimes in the summer. We had a problem when we owned our 100 acre farm with what some thought to be lady bugs. Thank god they didn't come with us when we moved. Ewwww yuck! I do hope this is the end of your creepy crawlers! I hope this means that they are gone for good! From VA here, too, and feeling your paining. Or in this case, smelling it! I detest the things and yest they just keep on coming to visit! Persistent little buggers aren't they. Those stinkbugs would drive me insane. My Mum uses one of those 'tennis racket' type fly swats to blast any invading insects into oblivion. I have never had the stink bug invasion.The first year we lived here we had the love bug invasion that had to have set some kind of record,the second year it was lady bugs! The last 2 years have been drought and that seems to have calmed down the bug armies some. You're hilarious! I'm glad you got the new guy who wasn't yet jaded. I can't believe the massive littering of dead stinkies you got! 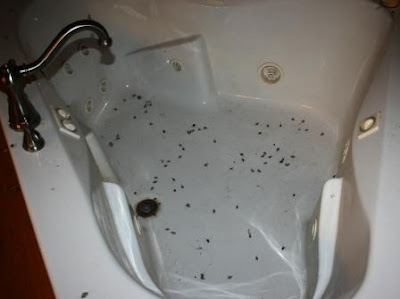 Good Morning, Gosh--you really have a problem... Hope the enthusiastic guy came back and sprayed again --around the tub... Maybe if he comes enough--you can get rid of those bugs.. I grew up in southwest VA --but have never heard of Stinkbugs... Hope you get some relief. That is really yacky!! I hope the guy fixed the problem for you. Isn't it great when you come across an employee that actually does their job?!!! You oughta let Terminex know how good he was! I am SO happy that he found the problem area! Sorry you had so much cleanup to do though, lol! Whoa! I'm glad he got to the source. What nasty creatures. Pesty little bugger/critters, aren't they? Bless your heart. I do hope this new guy has found the problem area and your battle with the stink bugs will soon be over. This is so encouraging for you! I know what a problem those icky little creeps were! So long, stinkbugs!! We had an electrician once. When he was new, he was, pardon the pun, really charged up about his work. Three years, and much success later, he grumbled about having to crawl under our house to wrap some pipes with heat tape, and then charged us nearly one thousand bucks for the privilege. I should have threatened him with stink bugs! Oh my! My still occasionally lingering fruit flies and spikders just can't compete with that! I'm grateful I've never had to deal with those! Oh my goodness!!! So you have doors under your tub? I haven't seen one like that. So lucky you got this new man!!! And I thought that bug spray wouldn't kill them!!!! We have been very lucky, not more than a dozen all year, if that. 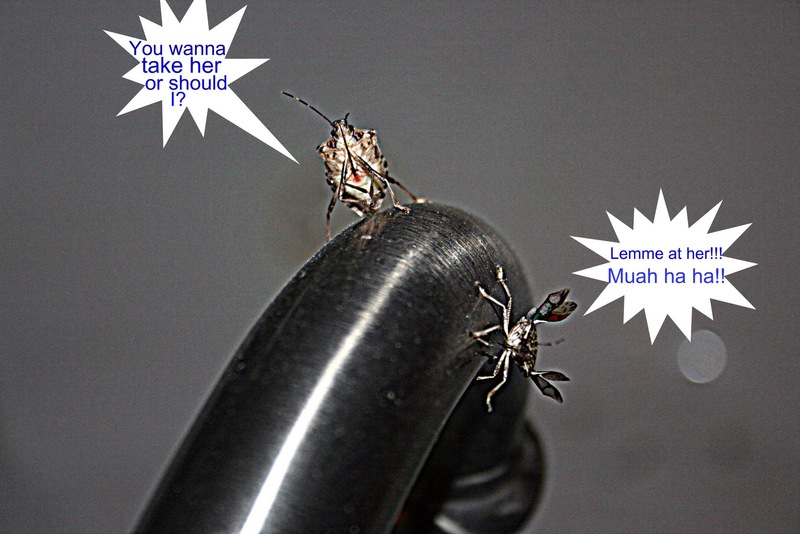 Our problem is earwigs, which I plan a future post on, complete with wildly gross pictures! Has your stink bug problem gone away? I love it when people think out of the box. I guess when you really want change, you don't want to surround yourself with people who are satisfied with the status quo! I am sooooo glad I don't have stink bugs. We had ants when we lived in KY 2 years, and these scary cave crickets in the bathrooms when we lived out in the country a few years. I DON"T LIKE BUGS!!!! Oh dear! I'm really glad he found where they were living and hopefully you won't have that problem anymore. I don't even know what a sink bug is, so I'll have to go look them up. I wonder if we have them around here? I have heard so many horror stories about stinkbugs – I don’t know how you all can take it. You have my sympathy. Thank you for stopping by my blog. I am curious how you found it. i would hat e to fight them, what a major infestion, almost a plague.LOLHope this does the trick. Oh man LIsa! We had those problems in my old apartment. Those little suckers! It took so long to get rid of them so I can commensurate! Gross! I live in an old house, so we are always battling something odd, but never the stinkbug indoors! They seem to come and go throughout the year and right now we don't have but maybe a couple a week. Did have a ladybug bop me in the head a couple of nights ago... she had been buzzing around inside my lamp and then came out and socked it to me. scarey that they can talk too! I hope your new guy really can eradicate them for good!! That is not a mess I would want to have to deal with-yuck! OMG! That is so gross. I think I would have packed up the boys and not stopped driving. We had them in Indiana, but not to that extinct....thankfully! I was hoping you had altered the picture- yucky! in SW FL we have "Palmetto bugs" which is a cute way to say "FL roach" - fortunately, haven't seen them like THAT! You get'em girl! We find those asian ladybugs like that around our house. Mostly in the garage which I don't mind as much but still they are nasty. oh yuk! Your stink bug problem makes my skin crawl. eek. I've think I've told you before, but the building i woke in is infested...i kill several each time i work. I can't imagine having to living with them!! my bug-a-phobic heart goes out to you! Oh good heavens! I hope you are able to get that under control- fighting battles like that is never fun! It's freezing cold and we had snow..and still the stinkbugs are rampaging. I really LOVED the advice I got about them...seal every single crevice into your home. Okay that would creep me out too. We are likely one of the areas you mentioned - too cold for them. The dialogue bubbles above the bugs, esp the evil laugh, cracked me up. We've got some pretty good ones where I am too. One of the only upside to the cold weather. Wow, that picture is horrifying!!! They are bad here, too. All through our attic, and I found them hiding behind a picture frame above a lamp. I hate those things!! !